2016 has been a tough year. If I’m totally honest, I’ll be really glad to see this back of it and though it’s only a kind of virtual, fake, made up new start each January 1st, there are things I’d like to feel are behind me so I can’t wait! Generally, cycling helps see me through turbulent times, but this year’s multiple injuries and ailments meant that even pedalling wasn’t always on the cards. So thank heavens above that Speedo got in touch with me, as if they hadn’t, I wouldn’t have started swimming and I would have been far grumpier. As an adult, I think there can be a lot of fear about starting something new, either that or there’s just too much analysis or deliberating. For sure, there can be a perceived lack of time, but I don’t think that’s truly behind our reluctance to dive in – there always seems to be time to TV. Often, we need a shove in the right direction, which is what I got! Initially, Speed wanted me to swap a ride a week for a swim and I wasted no time in telling them was never going to happen – less time on the bike will never appeal to me. Instead, we agreed that I’d add in a swim a week, which seemed desirable and doable. A few months later, swimming is firmly part of my schedule, and dare I say it, I look forward to my time in the pool as much as my time on the bike. A lot of what I do really gives my body a hammering so I like the free and easy, long, silky movements of swimming. It feels like a treat for my limbs. It’s also a treat for the mind. Sometime the kind cycling I do can also require a hell of a lot of concentration, whether it’s picking my way down a technical descent on my mountain bike, focusing on power zones and training intervals or trying to beat a PB down the Velopark. That can be mentally tiring. Of course I do enjoy easy going, carefree rides to unwind but swimming is different. It has a strange effect on me. It gives me a quiet energy, a nice gentle buzz that’s kind of like a good massage. I emerge from the pool feeling supple, relaxed and calm, shoulders thrown back. I love that swimming is all just me with no equipment at all – I know bikes are propelled purely by our bodies but you’re using a tool to move, rather than just your limbs. I also love that I use my whole body rather than just my legs. So I’d like to say thank you to Speedo for reintroducing me to this new way of training, relaxing, meditating, energising and stretching, because I’d been thinking of starting swimming again for so long but never got around to taking the plunge. 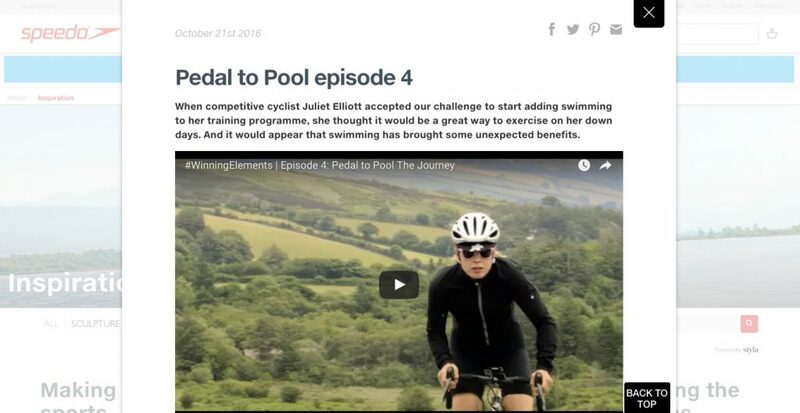 On the Speedo site my new Pedal To Pool video shows how and where I’ve been swimming this summer, the training I’ve been doing and also how I believe it’s affected my performance. Check it out for some fixed gear crit racing footage too. And finally, if you’ve any questions about getting started with swimming again or helpful workouts for cyclists, leave me a comment below – I’d love to share what I’ve learnt. Hi! Love your youtube channel and the blog. I am looking to pick up something different than cycling for 8 or so weeks over Christmas as cross training. I’m looking to incorporate 2 days of full body weight training and 2 swims a week, with a long endurance ride on a Sunday to keep my legs ticking over. The plan is to go from this cross training period into a 10 week bike specific training plan before the race season starts properly. I usually just ride my bike all year round, but feel as though I’m stuck in a bit of a rut recently. Could I expect to have a similar level of base fitness as I would if I were to ride my bike consistently? HI Chris! Thank you, glad you are enjoying them. Right then, personally I wouldn’t cut your cycling down to one day a week, especially if you are planning to race next season. Your swimming should really compliment your cycling rather than replace it. Gym workouts can be really good in the winter instead of getting out on the bike but not if you drop the time on the bike to the level you have suggested. I’m interested to know how you’ve structured your training in the past as that might give a clue as to why you are stuck in a rut. Perhaps you need to start varying the kind of sessions that you do each week? Go for a mix of intervals, endurance, sweet spot, gym work and swimming. Mix it up a lot! Pretty much every session I do on the bike is different and that really helps keep things interesting.